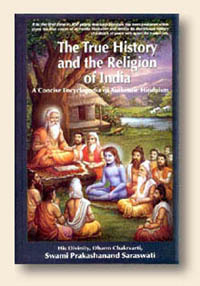 "The True History and the Religion of India"
you are now: HOME > "The True History and the Religion of India"
• "The True History and the Religion of India" is a single-volume, all inclusive, concise Authentic Encyclopedia of Hinduism which details all the aspects of Hinduism at one place. • It is an amazing sourcebook of Indian history, religion, and civilization. This 808 page book chronicles the entire history of Bharatvarsh (India) and expounds the essence of Bhartiya (Hindu) scriptural teachings. • This is the only authentic record which gives a comparative account of world history and civilization of the last 8,000 years, along with Bhartiya history and its unbroken civilization of 1,972 million years, with scientific evidences. Dimensions: 9.50" x 6.25" x 1.88"
• "The True History and the Religion of India" relates and represents the authentic form of Hindu culture, religion and history and describes the real Divine aspect of the Bhartiya scriptures – The Vedas, Upnishads, Puranas, Gita and the Bhagwatam. • The most amazing feature of this work is the enormity of information that has been systematically incorporated in it with scriptural, logical, historical and scientific evidences.